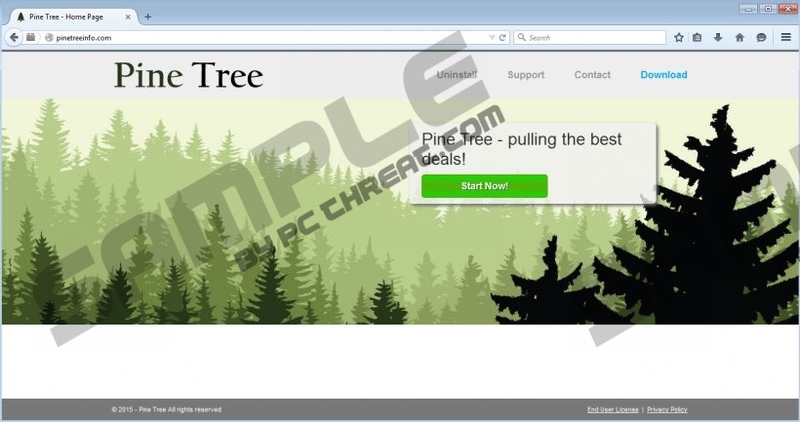 While downloading software from the Internet, you might run into various adware applications, and Pine Tree is one of them. We suggest that you remove this application because it is generic adware which does not have any other purpose besides promoting third-party advertisements on your Internet browser. Pine Tree tracks marketing-related data about your Internet browsing habits in order to customize the advertisements; however you will rarely find this commercial information necessary. Though Pine Tree is promoted as an application unrivalled at finding the best online deals and other money-spending opportunities, this app will rarely display offers that will be beneficial to you. We advise that you delete Pine Tree because there is no reason why you should waste the resources of your computer on this irrelevant application which only slows down your Internet browsing. The official site pinetreeinfor.com clearly states that Pine Tree does not take the responsibility for the content it endorses. Therefore, bear in mind that all the ads this application shows on your Internet browser might turn into entryways for malware to reach your computer. The application might promote services or products but the content is not always reliable; so, you should remove this application to prevent the risk of infecting your system. Developed by SuperWeb LLC, Pine Tree is actually a clone to Steel Cut, Green Box, Krab Web and other identical applications. If you visit the official site of Pine Tree and of, for example, Krab Web, krabweb.net, you will notice the same layout, and even the same vague product description. You will not find any specific information about the developers of these applications; hence, since SuperWeb apps are of uncertain origin and dangerous, you should delete them from your computer. Pine Tree does not look convincing enough, therefore the fact that it connects to the Internet without your permission might be another reason to remove this application. You might never be informed about the additional content it downloads without bypassing your authorization. It might download additional updates or helper applications, or even more malicious content. We are sure that you understand that keeping this app on your system is risky; therefore, you should not waste your time and take appropriate steps to remove Pine Tree from your computer. We have prepared the step-by-step instructions below. If you do not feel confident enough about your computer skills, we encourage you to give preference to automatic antimalware tools that will delete Pine Tree without requiring your interference. Select Pine Tree and click Change/Uninstall. Choose Swift Record in the list and click Change/Uninstall. Select Pine Tree in the program list and click Uninstall. Quick & tested solution for Pine Tree removal.